"SIP or VoIP phones: Key Considerations for Choosing SIP Phones"
Deploying VoIP with SIP phones is important for a successful business since a VoIP phone solution consists of both working in tandem – the service itself and the SIP phones as endpoints to access the service. Read this descriptive whitepaper that provides a roadmap for understanding how best to derive value from IP phones, especially when adopting a hosted VoIP phone service and what are the key qualities you should be looking for in a SIP phone vendor. 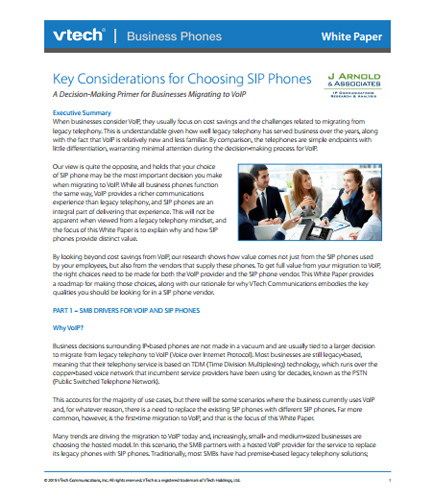 Download this whitepaper that articulates the value that SIP phones bring to the overall solution offered by hosted VoIP providers for SMBs. Together with the ever-increasing list of enterprise-grade capabilities and the world-class customer service of VirtualPBX, Dash is the perfect choice for every organization looking for one step ahead in their competition. VirtualPBX helps you lock-in the best rates for bandwidth as well as suggest the best routers and configuration to suit your needs. This whitepaper on “Virtual pbx business phone system,” reviews the following topics in greater detail and provides some guidance for wading through the options: Advanced Business Phone System Features Hosted vs. Standard VoIP PBX Breakdown of the costs associated with a typical hosted VirtualPBX system and that of a standard PBX system Recently moved or ready for an overhaul of your existing network? Go for Virtual business phone systems!